ABC News - Rock, what Rock? A drink-driver has stopped police in central Australia to ask for directions to Uluru, just 100 metres from the world's greatest monolith. Police say the 44-year-old New South Wales man was driving a four-wheel drive when he waved them down near an intersection close to Uluru. Police say the man's headlights were shining on the rock itself. 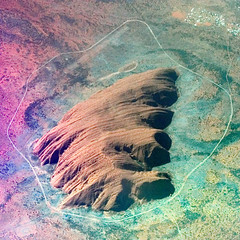 Police say although the incident took place in the dark, Uluru is 340 metres high and it is a 10 kilometre drive around its base. It casts an imposing shadow over the flat landscape around it. Police say they became suspicious when the man asked for directions to the rock and breath-tested him. The man allegedly returned a blood alcohol reading of 0.116. He has been charged with drink-driving and driving while unlicensed.